When you have an excess of clothes (like most of us! ), you will need to turn to closets and dresser drawers to store your clothing until their next wear. However, let’s be honest, if you have ever stored clothing in these areas than you know there is just something about these small spaces that make scents go off and spread onto your clean, once fresh smelling stored clothing. Have you ever washed your clothes and placed them in these storage areas, only to pull the article of clothing out the next day to smell that newly acquired musty smell? You may wonder if it is the laundry care products you use that is leaving this musty odor on your clothes or if the culprit of the odor lies within your storage areas. What can you do to remove this musty odor from your clothes, and get to the root cause of the issue to eliminate the nuisance odor all together? Find out below what you can do in an effort to keep your clothes smelling fresh in storage. Why Does My Closet Smell Musty? When you open your closet door, do you instantly get hit with the strong, distinct smell of musty/mildew odor? 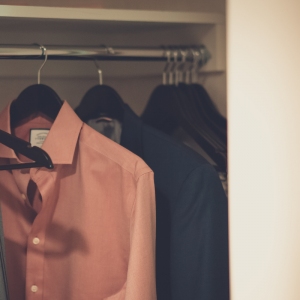 Closets are often times prone to develop this odor, leaving you to wonder why does my closet smell musty? Dampness. Water and moisture present inside your closet are one of the primary causes of mustiness and other mildew odors inside your closet, and even when you think that there are no traces of moisture present in your closet, think again! The configuration and design of closets often contributes to the musty problem in your closet. They typically are recessed back into the wall and are enclosed off by a door. Both of these features can restrict airflow into this storage area and allow contaminated, humid air in the space which can lead to mildew and mold growth that will lead to the undesirable musty odor. Having a fresh smelling closet is important, nobody wants to wear clothes that smell musty and dirty, especially when you take a lot of time to clean and care for your fabrics! 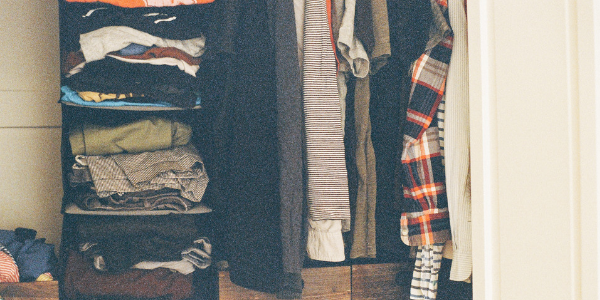 If you notice that your closet is smelling less than stellar (and a little musty!) now is the time to take action and work towards making your closet smell good again. Below are some steps that can be taken to expel the stinky odors from your closet and your clothing! Remove Everything: The first step is to remove everything from inside your closet and set it aside. Separate any machine-washable footwear, damp clothing, or outwear and put these articles into the washing machine. These types of garments are known culprits for mold/mildew growth because of the high moisture levels they are exposed to when wearing these items. You also want to wash any clothes that have developed that musty smell on the fabric. Be sure to hang these items to dry outside after washing them, this will help to remove any lingering odors. Closet Deodorizer: Once everything is removed from the closet, clean it thoroughly by vacuuming or sweeping up debris inside the area and wiping down the surfaces. These surfaces should be wiped down using an effective deodorizer to eliminate any unwanted odors. The OdorKlenz Source Odor Treatment is perfect for dealing with musty smells on surfaces, using a patented earth mineral technology the minerals break down and eliminate a broad spectrum of odors including mildew/mold odors. Organize Closet: After you have cleaned your closet, go through your clothes and donate clothes that you don’t wear. When your closet is too packed it can lead to odor issues. What Causes Clothes to Smell Musty? Clothing gets put through the ringer, with many odors coming into contact with the fabric and impacting the smell of the fabric. Body oils, grime, and dirt build-up will gather onto clothing leaving a foul-smelling odor on your clothes. These odors can all be undesirable, but when it comes to one odor that you do not want on your clothes, musty smell is at the top of the laundry heap. Musty smells are a result of mildew in your clothing or in your dresser. Mildew develops spores that accumulate in dark and damp environments, and even if we aren’t able to visibly see them, the smell will give it away. The moisture that triggers musty smells, often find their way into drawers from a damp piece of clothing, a spill, or even from humidity. How Do I Get Musty Smell Out of Dresser Drawers? Dressers are a very popular method for storing clothing, but it can also be a stinky one! A dresser is an area that is confined, dark, and has limited airflow making it the perfect environment for mold/mildew to grow and leave a musty smell. How can you remove this smell and restore your dresser to a fresh smelling state? Below are some tips on how to get that musty smell out of your dresser drawers. Empty Dresser: Open all your dresser drawers and remove all items inside. Once the dresser is empty leave the drawers open for at least 24 hours to let air circulate within these areas. Wipe and Deodorize: Wipe down the inside of the drawer to both clean and eliminate any moisture inside the area. To protect your dresser from developing odors in the future, try placing an odor-eliminating pad inside each drawer. This type of pad is designed to capture and destroy odors from the source, leaving the area protected from noxious odors. The battle of keeping your stored clothes smelling good may seem like an endless one. You probably have tried all the tricks and tips to expelling the less than fresh odor in your clothes – borax, baking soda, vinegar, essential oils, etc. However, your clothes still smell musty and old – with the fresh scent far from present on your fabrics. What can you do? It is time to step up your laundry game or time to add a laundry additive to help you do the job. 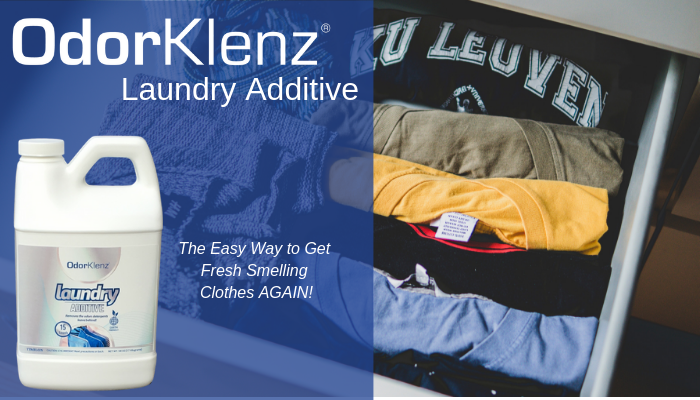 A laundry additive like the OdorKlenz Laundry Additive is the perfect weapon to use to achieve a fresh smell on your clothing, even the clothes that have been stored away in your dresser for who knows how long. OdorKlenz uses a patented earth mineral technology that allows for odors to be broken down and neutralized at the source of the fabric. It is easy to use, just add it with your unscented detergent in the washing machine and you will smell the difference!